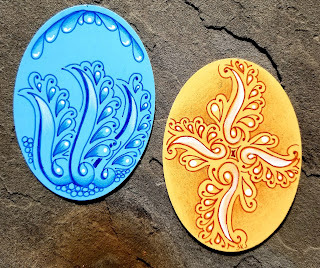 Sue's tangle trips: Easter Eggs! A blog about my zentangles, zentangle inspired art, and other artistic pursuits. In the Chicago area. 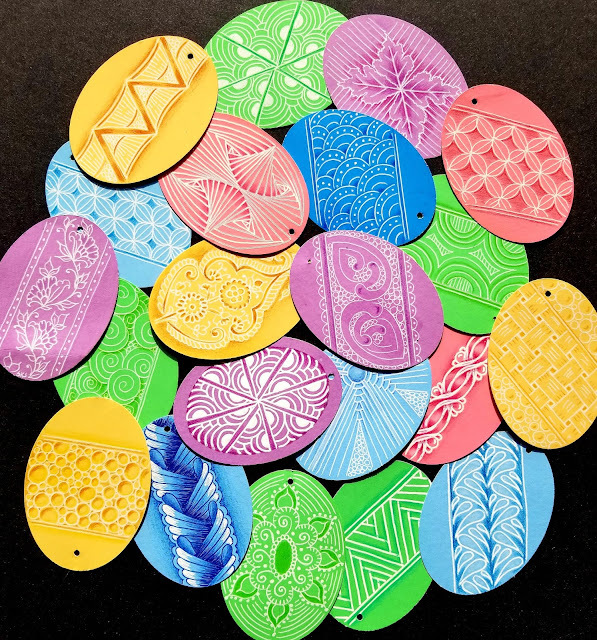 Easter will be here before you know it and there's not much time left for Easter crafts. So I'd like to show you my fast, easy, and cheap Easter craft. 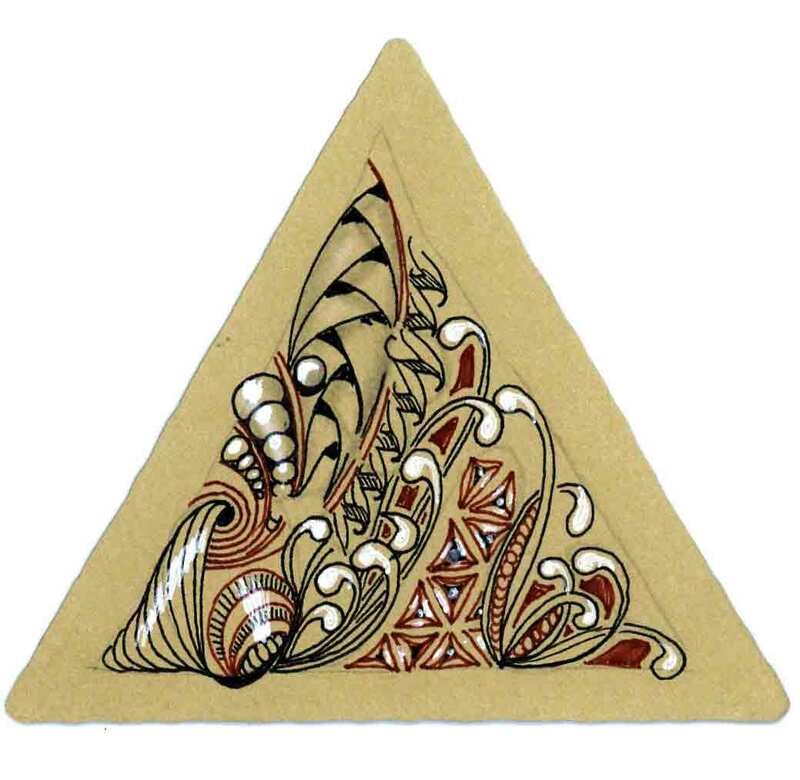 They are great for both Zentangle fans and kids alike. Make a trip to your big box, hobby store and look for a Giga, oval, paper punch. (Bring a coupon for that store or find a coupon online) Then go over to the rack of poster boards and pull out the pastel colored sheets. Cardstock paper will work too but I really prefer the thickness of poster board, especially if you are planning to hang these up. Grab a white gel pen (I like the Sakura Gelly roll pens). You will also need colored pencils that will shade whatever color posterboard you have chosen. Punch out the oval shape from the poster board. Draw one tangle per egg - and draw it BIG! I promise it will be easier and faster if you draw it big. When the ink is dry add shading with a colored pencil. Punch a hole at the top for hanging. You can also do these with colored pens. Then you can shade with the colored pencils and highlight with the white pen and/or a white chalk pencil. 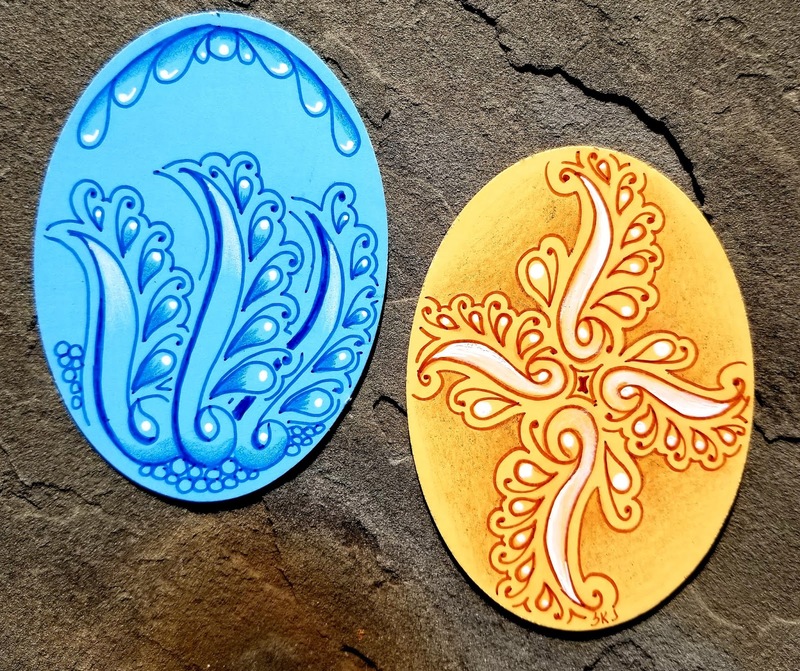 The two eggs above use the tangle pattern Raphael by Sandy Hsiao. Very pretty! I looked up your blog after seeing your art in "The Beauty of Zentangle". Your comments are always welcome and most appreciated. Please email me if you want a response sent to you. I regret that I've had to add the verification again due to a large amount of spam. Contact me to set up classes in my home or yours. More dates will be posted soon. Go to the Classes tab for more info. Amazon products I like - if you order through these links I'll get a referral fee. - Thanks!!! The text, photographs, step outs and design work is © Sue Jacobs. It is for inspiration only, and may not be copied for profit or publication without express permission from Sue Jacobs. So what is a Zentangle? "Zentangle is an easy to learn method of creating beautiful images from structured patterns. It is a fascinating new art form that is fun and relaxing. It increases focus and creativity. Zentangle provides artistic satisfaction and an increased sense of personal well being." Learning the lessons I teach: LISTEN! Giveaway from a.Amelia handmade at Sew, Mama, Sew!! Button - Button - Who's Got The Button? Content is copyright protected. Contact author for permission to use elsewhere. Ethereal theme. Powered by Blogger.